This volume of the Methods in Molecular Biology series is entirely devoted to the study of steroid receptor biology. Steroid hormone receptors represent a powerful system for the study of both the most fundamental molecular mec- nisms of gene regulation and control and the gross physiological responses of organisms to steroid hormones. Research in this field has brought forth advances in the treatment of cancer, endocrine disorders, and reproductive biology, and allowed elucidation of the fundamental biological mechanisms of gene expr- sion. 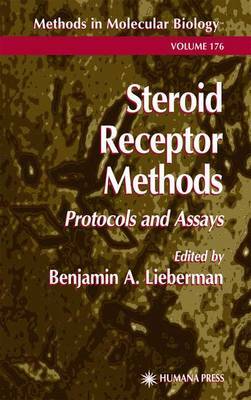 In Steroid Receptor Methods: Protocols and Assays, the reader will find a collection of methods and protocols submitted by many fine steroid receptor researchers from throughout the world. These authors have been instructed to create a highly informative cross-section of the latest research techniques ava- able. The resulting work is timely, useful, and approachable for both the ex- rienced researcher and the novice to the field. Because the steroid receptor family is represented by a wonderfully diverse, yet strongly interrelated set of steroid receptor proteins, Steroid Receptor Methods contains protocols for the prod- tion and purification of a variety of receptor forms, including the progesterone, glucocorticoid, and androgen receptors. These procedures provide the raw ma- rial needed to conduct sophisticated biochemical analysis of receptor properties. Other techniques presented allow the reader to perform biochemical experiments on DNA binding characteristics, hormone binding assays, and protocols using combinatorial chemistry for drug discovery.